"Satan was the first revolutionary and through this fell from heaven . . . So all revolutionary societies, secret or open, under whatever names they may come, no matter how attractive their appearance, they have one common goal: the total destruction of Christianity, and paving the way to anti-Christianity in the face of the Antichrist's entrance into the world." St. Seraphim of Sarov is one Russia's most well-known saints. He was born on July 19, 1754, and he lived in Kursk, Russia. As a young boy, he loved to read the lives of the saints, to attend church, and to spend time in prayer. At the age of 18, he decided to become a monk. His mother blessed him with a large copper crucifix, which he wore over his clothing all his life. St. Seraphim lived in the forest wilderness, not far from the Sarov Monastery. Wild animals—bears, rabbits, wolves, foxes and others—came to his hut, and were at peace with him. Matrona Plescheeva, eldress of the Diveevo monastery, even witnessed St. Seraphim feeding a wild bear by hand. During the course of his life, he was miraculously healed on more than one occasion, and he saw numerous visions of Christ, Mary, angels, and various saints. Many thousands of people from all walks of life began to visit St. Seraphim. Everyone saw him as meek, joyful, and sincere. He greeted each person with the words: "My joy! Christ is risen!" And he often gave this advice: "Acquire a peaceful spirit, and around you thousands will be saved." No matter who came to him, he bowed to the ground in respect. 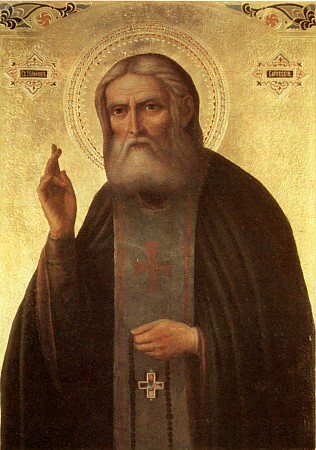 St. Seraphim also received the gift of prophecy. Prior to his death in 1833, he foretold many of the future trials that would befall both Russia and the entire world. He prophesied the great persecutions that would eventually overwhelm Russia in the years of Communism, and he foresaw the incredible renewal and growth of the Church that would take place afterwards. He also spoke of the Antichrist and the future one-world-government. 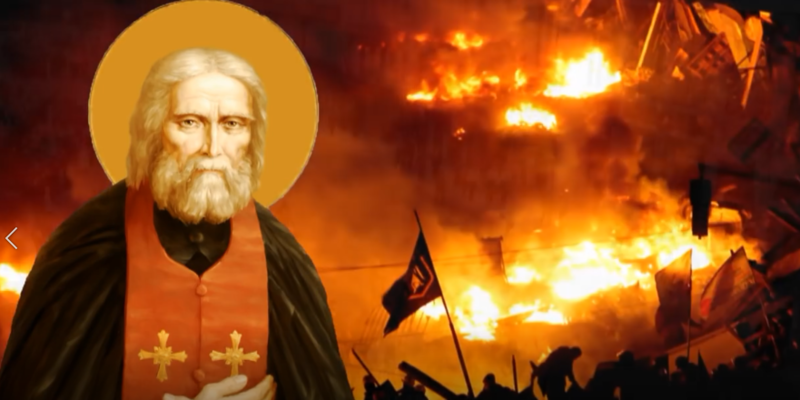 The following video contains samples of St. Seraphim's prophecies about Russia, Europe, and the end of the world. If you enjoy this video, and you would like to see more films like this, please share your thoughts in the comments section, and let us know. Before the birth of the Antichrist there will be a great and long war and a terrible revolution in Russia, passing all limits of human imagination, for the slaughter will be terrible. The rebellions of Ryazan, Pugachev and the French revolution will be nothing in comparison with what will take place in Russia. Many people who are faithful to the fatherland will perish, church property and the monasteries will be robbed; the Lord's churches will be desecrated, good people will be robbed of their riches and killed, and rivers of Russian blood will flow. But the Lord will have mercy on Russia and will bring her along the path of great sufferings to glory . . .
Everything that bears the label of 'Decembrists', 'Reformers', or belongs to 'the party for the betterment of life', is genuine anti-Christianity, which will bring about the destruction of Christianity upon the earth — even destroying part of the Orthodox Church — and which finally will end with the enthronement of the Antichrist over all the nations of the world, except Russia. She will come together into a single united body with the other Slavic nations and comprise a huge ocean, before which all the other tribes on earth will tremble in fear. And this is as sure as 2+2=4. By the combined powers of Russia and others, Constantinople and Jerusalem will be inhabited. At the division of Turkey almost all will go to Russia, and Russia with the united forces of many other States will take Vienna, and about 7 million native Viennese will remain . . . and there the territory of the Austrian empire will be constructed. Because of France's love for the Mother of God — the holy Madonna — the country will be given to 17 million Frenchmen with its capital in the city of Rheims, while Paris will be completely destroyed. Napoleon's home will be given to Sardinia, Corsica and Savoy. When the Russian Empire receives 180 million into its dominion, we must expect the appearance of the Antichrist. Jesus Christ, the true God-man, the Son of God the Father by the descent of the Holy Spirit, was born in Israel, while the true antichrist will be born amidst the Slavs and Russians. He will be the son of a virgin adulteress of the tribe of Dan, and he will be the devil's son, through male seed that is artificially transfered to her. The spirit of darkness will dwell with him in her womb. until the birth of the antichrist will curse the antichrist at his birth and will announce to the world that he is the true antichrist. Satan was the first revolutionary and through this fell from heaven. Between the teaching of his followers and the teaching of the Lord Jesus Christ there is nothing in common, but a huge gulf. The Lord calls men to follow His commandments, and thereby He calls mankind to heaven, where righteousness dwells. The spirit of darkness promises the building of paradise on earth. So all revolutionary societies, secret or open, under whatever names they may come, no matter how attractive their appearance, they have one common goal: the total destruction of Christianity, and paving the way to anti-Christianity in the face of the Antichrist's entrance into the world. The faces of people (even spiritual people) prove that these teachings follow one after the other, that they converge with each other. To merge these teachings together, to reconcile God with Belial, is crazy. And not only is it displeasing to God, it is blasphemous. And the Lord, warning about this, said: "Many will come in my name and will say they are Me." (That is, many people will try to preach like me.) — Do not believe them. For the final curse of all Freemasonry, the Illuminati, Jacobinism, and all such parties, under whatever names they appear, the main leaders of which have one single goal: under the pretext of complete egalitarian earthly prosperity, and with the aid of people who have been made fanatical by them, to create anarchy in all states and to destroy Christianity throughout the world, and, finally, by the power of gold concentrated in their hands, to subdue the whole world to anti-christianity in the person of a single autocratic, God-fighting tsar - one king over the whole world. From then until now, Christ's teachings have survived and have been preserved. We have the traditions of the Holy Apostles, which were explained and affirmed repeatedly by the sacred successors to the Apostles, and by the Holy Fathers, led by the Holy Spirit, at the seven Ecumenical Councils. "Woe to the one who adds or subtracts one word," says Fr. Seraphim. — Our Church has no deficiency. Woe to those who dare to make any changes in the Divine Liturgy and the teachings of the Church, which is the Pillar and Foundation of Truth, and of which the Savior said, that even the gates of hell would not prevail against her, that is, that it will remain unchanged until the end — until the second coming. Any desire to amend the rules and teachings of the Holy Church is heresy. The desire to create your own special Church on the basis of reason, is a departure from the ordinance of the Holy Spirit, and is a blasphemy against the Holy Spirit which will never be forgiven. This is what all those who fell away from unity have done and will do with the Holy Apostolic Church. The bishops of the Russian land and the spirituality of Russia will go in this direction, and the wrath of God will smite them. "Jesus Christ is the same yesterday, today, and forever." He gave His teachings and commandments once and for all, without change, because this is the truth brought from Heaven by the Son of God Himself. Science and human teachings should be subject to change and improvement, but the Divine teaching given to us cannot be changed by people. The Lord Himself is unchangeable, and He is the one who established the holy Church and the sacraments. Therefore, says Fr. Seraphim, there is no place for human reasoning. See what Fr. Seraphim often told everyone about what would happen to him: "My bones will be resurrected, and I will go from Sarov to Diveyevo . . . "
Did you enjoy this video? Would you like to see more films like this? Please share your thoughts in the comments section, and let us know.